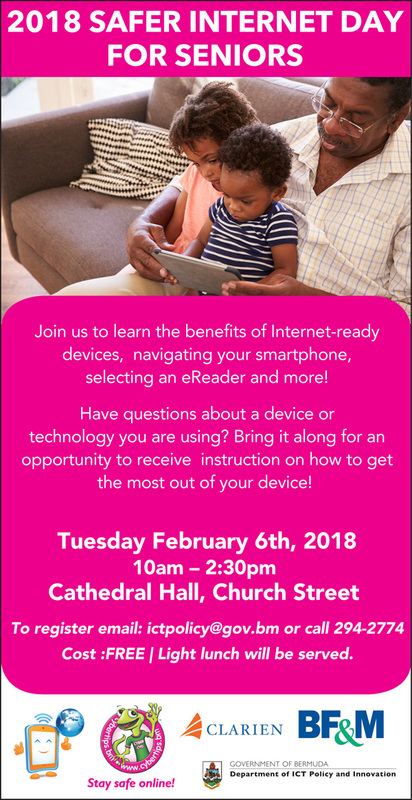 The “2018 Safer Internet Day for Seniors” free event will be held on Tuesday, February 6 from 10.00am to 2.30pm at Cathedral Hall on Church Street. A spokesperson said, “The aim of the free yearly event is to provide the Island’s seniors with the opportunity to learn the different ways to use technology to their advantage and how to navigate past dangers such as online fraud, identity theft, etc. To register, email ictpolicy@gov.bm or call 294-2774. Light lunch will be served.